Forest Garden 6 x 8 Overlap Pressure Treated Apex Shed: This Forest Garden overlap pressure treated shed is designed to be long lasting and an excellent place to store all of your gardening essentials. The shed features a single door with Z framing for added strength and hidden hinges for added security. The shed also has 2 windows which have polycarbonate glazing which will not discolour or go brittle over time. 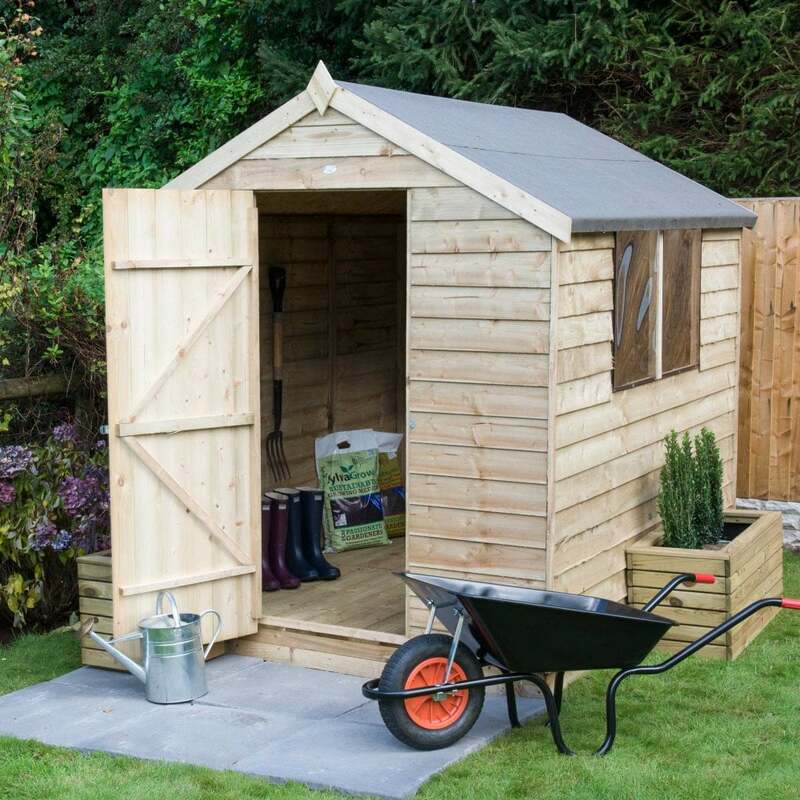 This garden shed has been pressure treated in the factory to give it a long lasting rot free finish without the need for time consuming annual treatments. The shed comes with a 15 year guarantee against rot and fungal decay for absolute peace of mind and includes shed felt to make the roof water tight. There is a robust pressure treated boarded floor included with this wooden shed and an OSB sheet material roof. The overlap timber is rough sawn and is square cut to help the rainwater to run off the side of the building and the overlap design allows for flexibility for the natural movement within the timber. This garden shed is delivered flat packed in sections which are simple and easy to assemble with the included instructions. NB: This Timber has been pressure treated in the factory which will give the wood a darker appearance. The Shed is guaranteed against rot and fungal decay for 15 years – there is no need to treat it once erected. View the full pressure treated Sheds range at Simply Log Cabins.